Last night the Patrick Henry Women’s soccer team celebrated Senior Night with a 4-1 victory over Mission Bay HS in what is the final game of the Eastern league. What made that game unique was Patrick Henry took the field as Champions of the league with one game still to play. The team boast a record of 6-1-1 in league, with a total of 19 points (out of a possible 24). The team led by 6 seniors has been a dominate force in each game imposing a style of play that is both fun to watch and brings results. 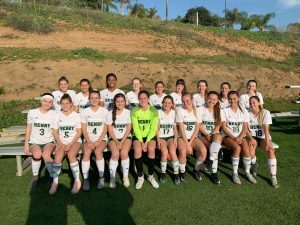 The Girls Soccer team currently sit as the #3 seed in the CIF Power Rankings and will find out their playoff position on Saturday afternoon for the Div 2 CIF Championships.